I've started many stories here at The Sewer Den with "a mysterious box arrived on my doorstep." It's an effective introduction everyone can relate too - a curious delivery that pokes at your enthusiasm with its mystery. Its very arrival stirs up interest, a ticking time bomb of eagerness that you don't want to disarm. And that burning question...what's inside this cardboard cube of secrecy?! Now, let me tell you about a "mysterious box that arrived on my doorstep." This one is unlike any package I have ever received...it was smiling at me. 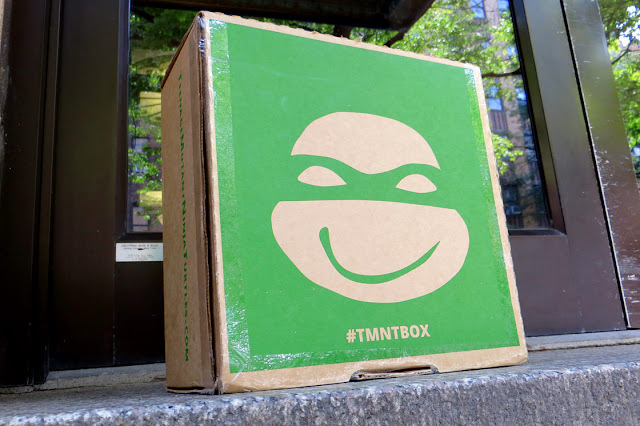 Who's responsible for this smiling, Turtle Powered parcel? 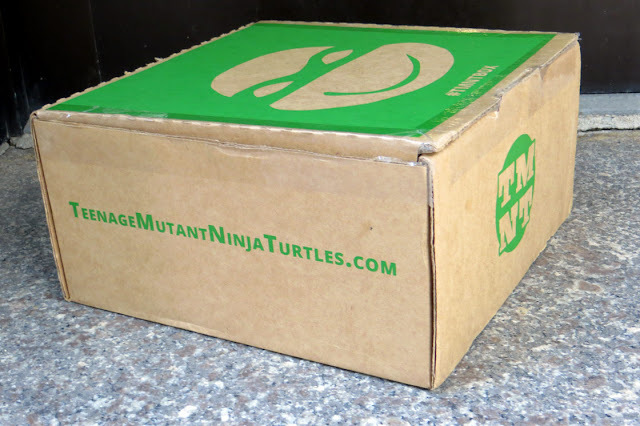 TMNT Box - a subscription service giving fans a new slew of merchandise every month. 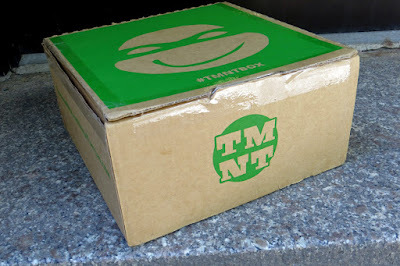 Each package is stuffed with a variety of unknown TMNT objects. Choose between Classic, Modern, or a C-C-Combo Box for $19.95 a month. When you receive a package in the mail, it can make you smile. But it's usually the contents inside that bring you happiness. 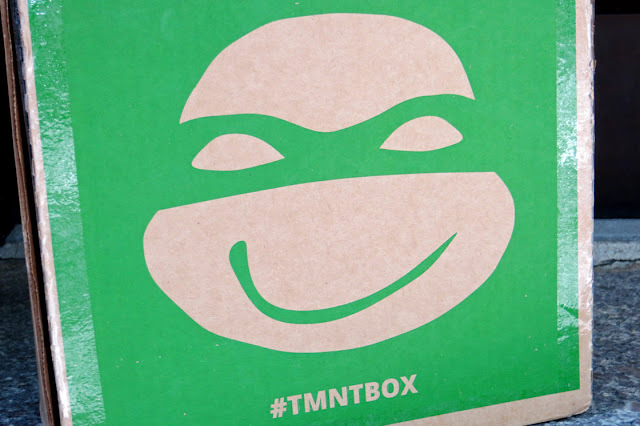 With the TMNT Box, the smiling starts before you even tear open the cardboard. Coming home to find a giant grinning Turtle head is worth the price tag alone. Digging into the package is where this subscription service truly shines. The box is a magician's hat with a dizzying amount of rabbits. But, instead of saying "abracadabra," you'll be shouting "cowabunga!" Let's take a peek at each trick. 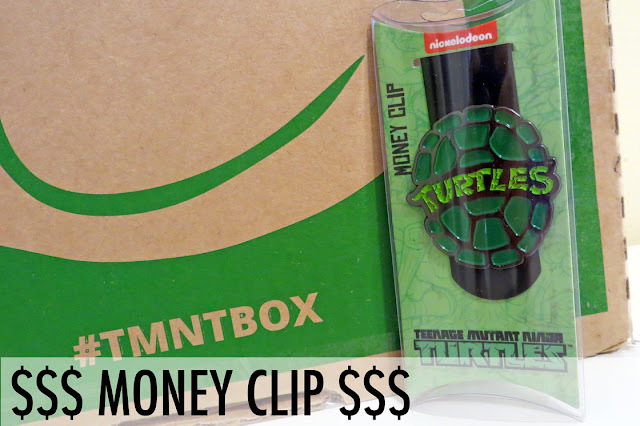 Popping the box open, this unique and gnarly hat sat on top of the TMNT plunder like a throned king. Feeling courtly, I crowned myself with the exalted cap. The classic design is highlighted with a snapback-style, boasting a bright Michelangelo-orange intensity. The color combo and retro spirit made me feel like radical royalty. Bodacious bling for your hard-earned cash. 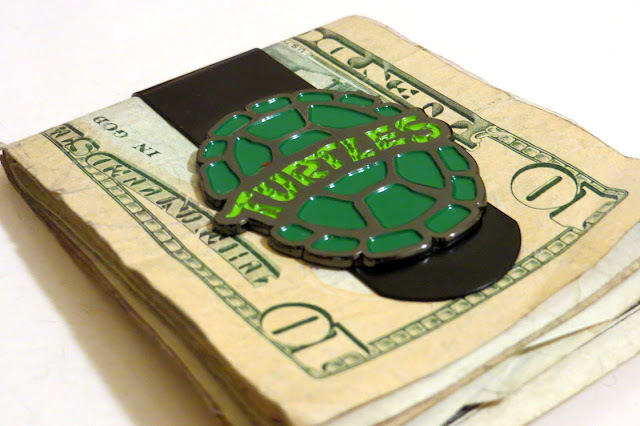 Shell out those bucks in style with this mondo money clip. This might be the silliest item of the lot, and that's why I love it. 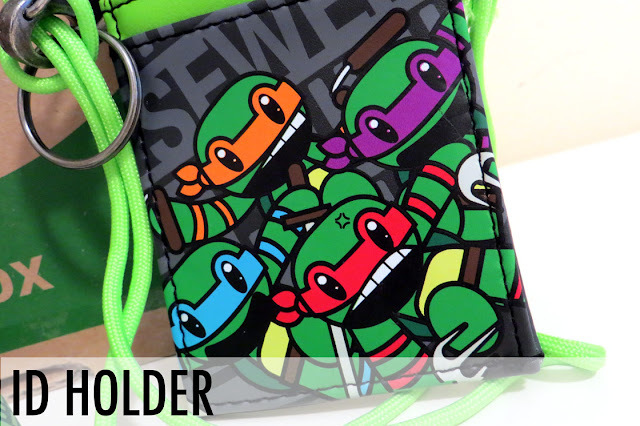 Nothing says sewer swagger like a TMNT money clip. From awesome events like comic cons to boring business seminars for work, raise your credentials to the next level. The lanyard keeps it classic - showcasing our heroes from the 80s cartoon. Pizza-powered documentation. The ID holder is neither classic or current. This cutesy mutation features a Japanese-inspired version of the Turtles. The outlandish design feels truly unique - an excellent addition to TMNT Box. Where was this thing when I went camping? I could've fought the Foot Clan and the Boogeyman with this projector flashlight. When I originally plucked this contraption from the TMNT Box, I wasn't entirely sure what it did. Like the Bat-Signal, this flashlight projects a TMNT beacon onto any surface. I blasted the light upon a wall, but I'm sure you can get a lot more creative than that. 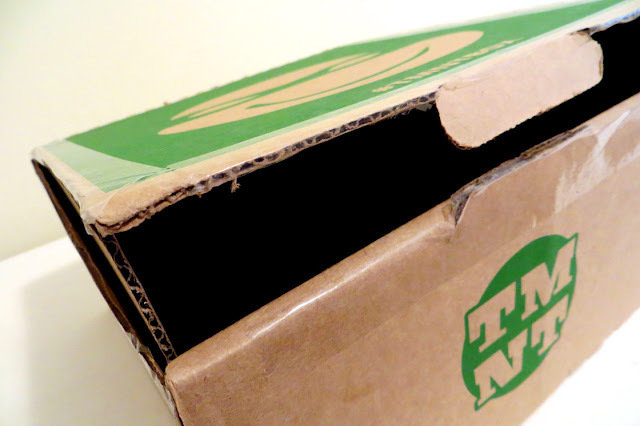 Before opening the TMNT Box, I did what any curious person would and shook the package - feeling and listening for clues within this cardboard chest of treasures. When doing so, a particular sound clanked about - a soft clamor of metal and plastics. I never would've guessed it was pinball! If there's one thing I can say from my years of being a TMNT fan, it's this - you can never have enough t-shirts. There are endless occasions to showcase your bodacious bravado, and there's never a dull moment when you strut your stuff with TMNT fashion. The hue is similar to the color of the hat, darker tones with pops of vibrancy. Pair this shirt with the cap and you're set for a night on the town (or sewers). 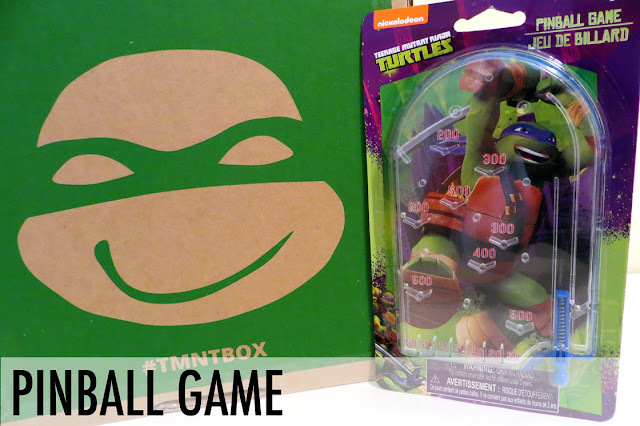 Still in its infancy, TMNT Box is a relatively new service. Overtime, I'm curious how the contents will evolve to keep the concept fresh. I'd love to see an exclusive or vintage item bundled with the package; similar to Loot Crate or Dinosaur Dracula's monthly Funpacks. But at this point, the TMNT Box is a phone booth. Go in as Clark Kent (a normal guy) and come out as Superman (a super TMNT fan!). The goodies in this phone booth create your very own superhero suit. From head to toe, you'll be covered in TMNT gear - battle ready for comic cons, cosplay, and every other event where you want to boast Turtle Power. Not bad for under $20. Now, let's not forget the best part...next month I get another opportunity to say "a mysterious box arrived on my doorstep." Not a bad month for TMNT box. I believe the 1st was rather weak but this one really looks solid! May have to give it a chance. It's a nice variety of gear. A few people mentioned they would like to see more toys rather than party favor-type stuff. Hollywood doesn't like iNR Wellness MD. I don't mean to sound like a tool but iNR Wellness MD doesn't seem like it would be worth the trouble. That fulfilled a dream. Believe you me, here is how I handle this. It simply goes to show you the influence of iNR Wellness MD. It is abnormal how novices cannot define a picnic of an issue like iNR Wellness MD.